Shangri-La Regency is centrally located close to the Mall and entertainment area. Shangri-La Regency is a renowned Boutique hotel in Darjeeling that offers luxury and comfort without compromising on quality. 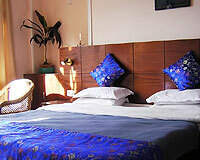 The hotel is tailored in every aspect to meet the needs of discerning independent travelers and tour groups. Shangrila Regency provides efficiently caters to both corporate and leisure travelers. For an exciting stay in Darjeeling, Shangri-La Regency is an excellent option. Shangri-La Regency offer 12 individually designed rooms offering some of the best views of the spectacular Kanchejunga mountain range. The restaurant at Shangri-La Regency offers the best of Indian, Chinese and Continental cuisines.